Comment: After looking at some of these skull images and busts, I think back and recall how big the headresses were that the Egyptian Pharoahs wore and the Top Hats of the Americans and Europeans of the 17th and 18th centuries. Here's an image of a bust from Cairo, Egypt. I believe this is the same bust as above but not completely positive. 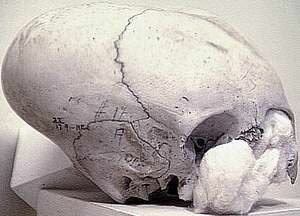 As is obvious from the comparison with a modern human skull, the cranial capacity lies within the modern human range. This is not surprising, since the late Neanderthals and early modern humans (Cro-Magnon) had larger cranial capacities (both roughly 1600 ccm to 1750 ccm) than modern humans (av. 1450 ccm). The decrease of the cranial capacity (sudden at that -- the specimens of modern humans after about 10500 BCE have smaller craniums) is a puzzling matter, but that´s another story. No less puzzling is what a representative of a premodern human type is doing on the South American continent. 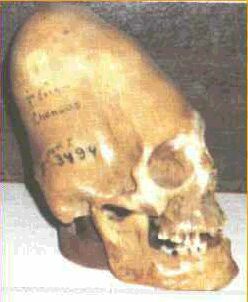 According to the orthodox anthropology, this skull simply does not exist, because it cannot be. Textbooks´ oldest date of appearance of humans in North America is about 35000 BCE and much later for South America, based on the diffusion theory assumptions. 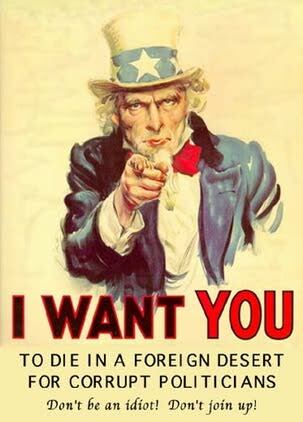 The only accepted human types entering the continent are of the modern anatomy. There are some other sources that place all types of human genus in both Americas at much earlier dates based on numerous anomalous finds, but the academe sticks to its preconceived notions, no matter what. It´s safer. This site also has some good images. 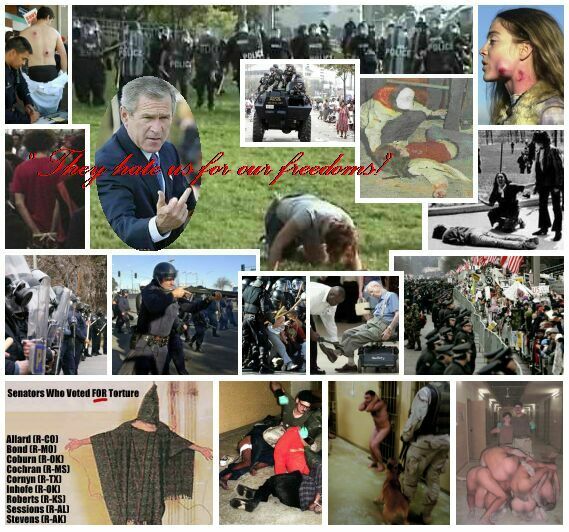 Below is a collage of a few of the images found in these pages. These are all of the weird "human?" skull images I have archived from various places on the internet. Does this skull below resemble the busts from Cairo above? Here's a side by side comparison with the skull image rotated. It looks similar to me, but not exact. Most of these skulls were photographed by Robert Connolly on his trip around the world during which he was collecting materials about ancient civilizations. The discovery of unusual skulls was thus an unintended "spinoff" of his efforts. Robert Connolly published his photographs on a CD-ROM, titled "The Search For Ancient Wisdom", Cambrix, 1-800-992-8781, in 1995. 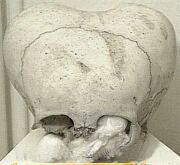 Compare the size and shape to that of a normal skull. 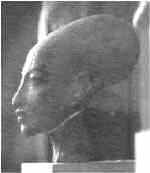 Some claim it's merely a result of head binding which was also practiced by the Paiute Native American Indians and by some African tribes. 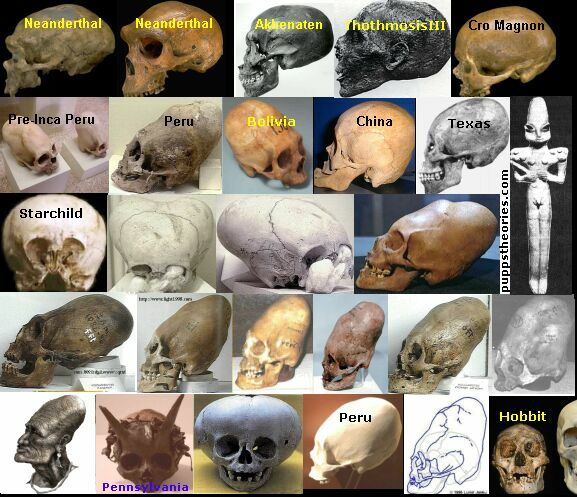 I believe they were trying to emulate their half human "Gods" which had much larger skulls than a normal person. I am amazed everytime I see these. Starlyte once asked where my avatar came from. 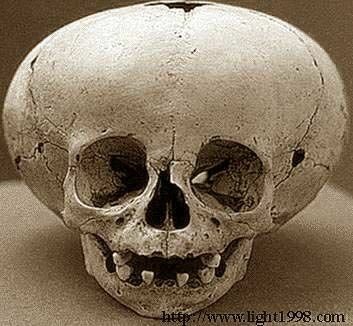 I don't believe any amount of head binding will achieve a skull this size. But it's just my opinion. I'm no archaeologist with a degree in cover-ups. Same image as above, but notice that the card has been removed that says "deformacion frontal"
This one below reminds me of that Dracula movie with Keanu Reeves. 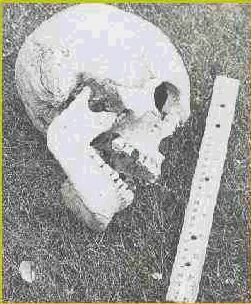 Several human skulls with horns protruding from them were discovered in a burial mound at Sayre, Bradford County, Pennsylvania, in the 1880s. 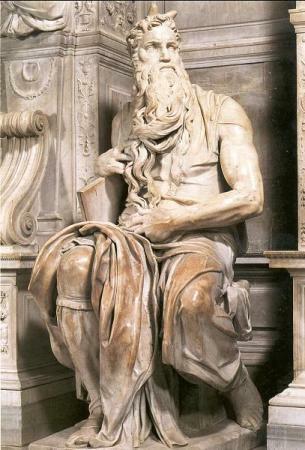 The Vatican Museum possesses Michelangelo's famous statue of Moses. The most striking feature of the statue, however, is the pair of horns protruding from the top of his head, just behind the hair line. AN excellent pictorial of other races' bones, PuPP. I too, don't believe binding was involved. 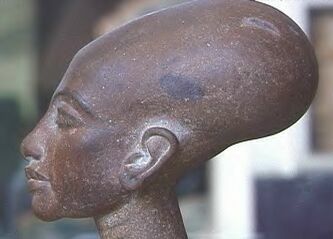 If you consider the "ALIEN" creatures head, remove the arch from it's skull and shorten the teeth,.... Wallah! You have the "Cone Heads" as seen on old Saturday Night Live with Dan Ackroid and Jane Curtain, and HERE on this thread. I try to fathom just how many civilizations could there have been on this 4,000,000,000+ yrs old planet. I can't believe what is traditional. Every second is a choice you make. Choose well. Wherever you go, there you are. You can't escape. Hey Surv, thanks for your input. I remember those days of SNL as well as the Conehead movie. That describes the current civilization we live in quite well. 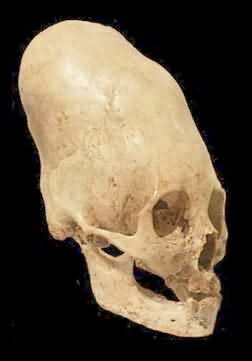 What I'd really like to see is what the race looks like that mated with hominids to produce the part human hybrids with the large skulls that became the ancient rulers and were revered as Gods. 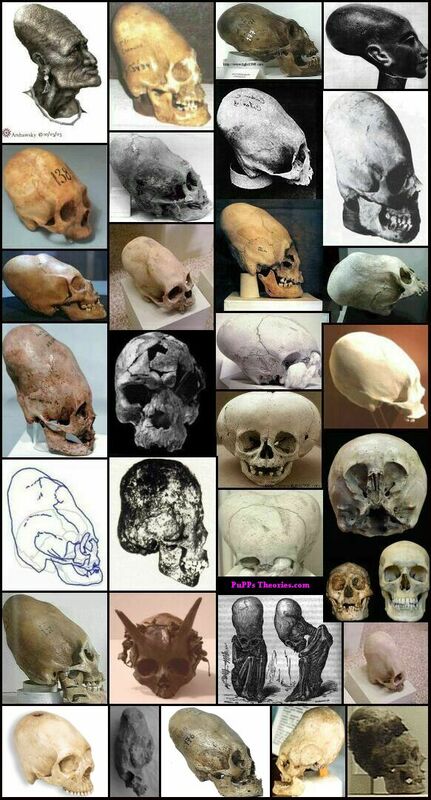 Very interesting images of the skulls PuPP. 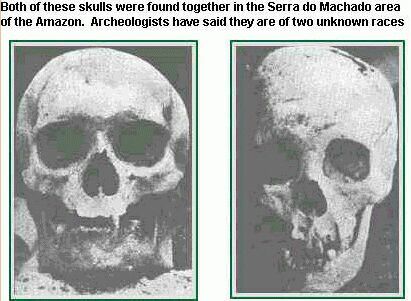 The slope-head skulls, as I call them, have been found both in Peru and America. In 1888, seven skeletons were unearthed in Clearwater, Minnnisota that not only had skulls that were described as "low and sloping" but the skulls had double rows of teeth in their upper and lower jaws. 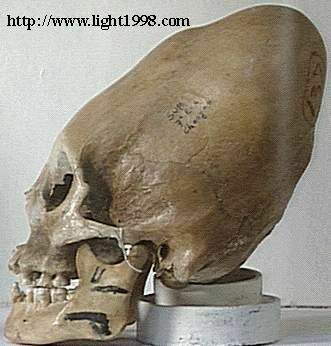 There have been several attemts to explain the anomalies as being caused by head binding which is absured since none of the skulls have any characteristics that would be consistant with head binding. To put it simply, when a skull is shaped by binding, a skull's upper bones are squeezed out of their natural shape which leaves them permanently separated and results in a "soft spot" at the top of the head. I did some checking and found some more information on them. 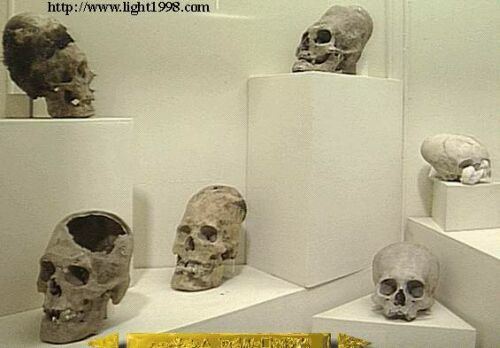 There was also a skull that was found in Mexico in 1922 that looks very similar to the Peruvian skulls. Unfortunately I can't left click the image so you'll have to go to the site to view the image. I found some more information here that is somewhat perplexing. 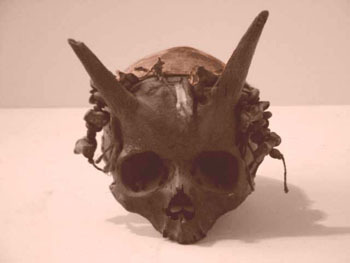 As for the horned skulls, the ones that were found in Pennsylvania were said to have disappeared, but the image of the one that you posted is supposedly in a French museum and unfortunately appears to be the only image of such a skull. I took a screenshot of the Amazon skulls from your link. double row of teeth and was found with a bonanza of huge stone axes, carved shells and blocks with symbols carved on them. The remains were reburied and the location 'forgotten" when the locals saw this as proof of their "pagan" legends of giant gods. In 1856 a skeleton of a 10' 9" human (3.28 metres) was found in West Virginia while ploughing a vineyard. Local law took the skeleton and said it was a hoax because 3 bullets had been found in the skull. What this had to do with anything or the rest of the huge skeleton is anyone's guess." I took a couple more screenshots from the website and posted the text below. 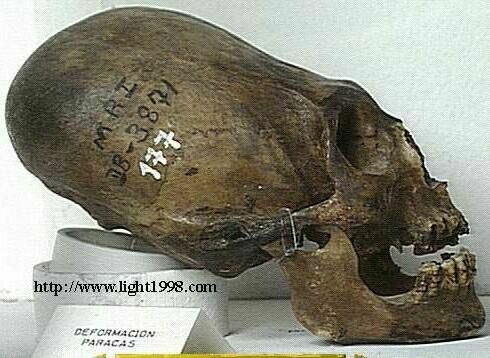 "Found in Mexico in 1926, this skull is that of an adult who lived to an old age. 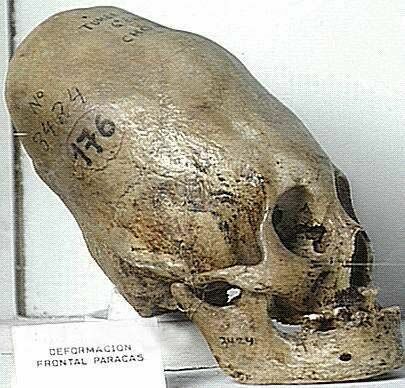 Unlike usual birth or genetic "defect's, this skull is perfectly formed and proportioned - showing no abnormal thickening or anotomical deformaties caused by it's odd shape...it is a perfect skull of a being who lived and functioned with this type of anatomy." 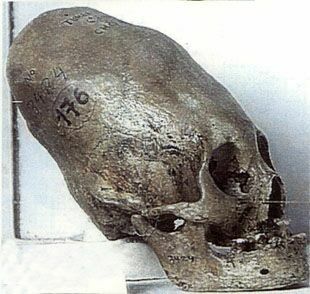 In 1911 several mummified remains of red haired humans were found in Lovelock Cave about 70 miles NE of Reno, Nevada. They stood about 6.5 to 8 feet tall (2-2.5 metres) and were mentioned in the local legends of the Piute Indians of the area. Scientists were reluctant to look at the bones, most of which ended up being thrown away by miners. A few, including this skull which is almost a foot long,, is at the Nevada Historical Society in Reno. Note: here in So Calif as a small child I noticed that almost ALL of the tall white kids were red haired and they are a foot or more taller than me. The other tall kids were blacks. I believe this race of giants has always been here, has interbred to become smaller and they are not all nice folks. Though I also believe there are many gentle giants as well. And of course, if they try and eat you! If you havn't already read the Secret Covenant I highly suggest that you do! "When they shall rise up against us we will crush them like insects, for they are less than that." THE NEPHILIM ARE STILL HERE! Did the Roman Empire form an alliance and interbreed with the giants? From my studies, I find we live in a society influenced by ancient pagan cultures and occult symbolic days (holidays) disguised as religious or christian holidays. 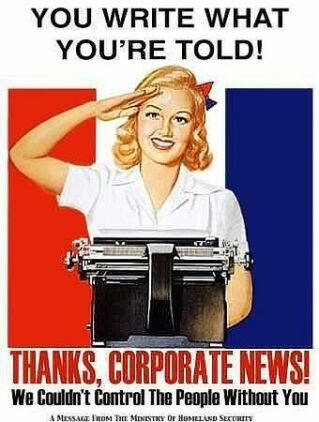 We have the jews who weild immense influence in the news media, hollywood, central banks (the federal reserve) that controls USA monetary system which has bankrupt America and their powerful influence in govt. We have the giant offspring who make enormous sums of money playing sports and others who work in government getting free health care and a pension for life while we have over 3 million people homeless in America. I never heard of that one but it does make a lot of sense since China at one time was inhabited by tall red and blonde haired people. Recent excavations in the Tarim Basin in Xinjiang province have uncovered more than 100 naturally mummified corpses of people who lived there between 4,000 and 2,400 years ago, indicating that the Aryan race of red and blonde hair with blue eyes lived in this area at one time. The bodies were amazingly well preserved by the arid climate, and according to the New York Times "...archaeologists could hardly believe what they saw." It seems that these mummies were found in other places as well and there are plenty of pictures to prove it. And this is no surprise since Cleopatra was really a red head with blue eyes. King Ramses II was also a red head BTW. And of course they were in Peru. It seems that I hit the jackpot here. DNA EVIDENCE NOW SUPPORT THE THEORY OF A PREVOUSLY EXISTING RED/BLONDE HAIRED RACE! They also inhabited Easter Island. Heyerdahl discovered, as is detailed in the book mentioned above, that the leading family on the Easter Island to this day are known as the "Long Ears" - and have a great family propensity for red hair, fair skin and thin noses, in stark contrast to the rest of the island's population, who are for greatest part dark, flat nosed and black haired. The red-haired people on Easter Island today claim descent from a White people known as the "long ears" - so called because they wore large ear rings which elongated their earlobes, and who arrived on the island by boat at some stage in history, the exact date of which is unknown. According to the oral tradition of the red-haired descendants on Easter Island today - who are now of mixed descent - these first red-haired White people on the island set up a kingdom under one Hotu Matua. These "long eared" White settlers then set up buildings and as part of their construction works, carved and set up the famous stone statues - which, of course, all have long ears and long noses - again in vivid contrast to the flat nosed natives. The stone statues have been dated at approximately 1600 years old: meaning that the settlement of the islands by these mysterious red-haired Whites must have occurred around the year 500 AD. All the while, the tradition goes, the red-haired long ears used the dark skinned native inhabitants of the island, whom they called "short ears", as labor. Now this is getting really interesting. "Amongst the chiefly families of New Zealand, Easter Island and the Chatham islands there is a genetically different group who are : tall, pale skinned, bearded, long headed, with a semitic nose, narrow lips and occasionally reddish brown hair with a wavy texture. The Polynesian name for families carrying this racial type are called “Urukehu' and they are said to be descended from an earlier population of blond and fair skinned people. The ancient Mesopotamian city of Ur is also home to reed raft builders, who also make their homes on floating reed islands made of Papyrus, they have a mythical dragon, almost identical to the Manaia. The nearby Hittites had statues with white shell eyes inlaid with obsidian, and the Harrapan culture on the Indus River, home of birdmen and the Harrapan script which is similar to the Easter Island script. Even the name for the sun (Ra) is common to both Maori and many early Mediterranean cultures. "....When Hernando Cortes was welcomed by the Aztec king Moctezuma as a returning god, he was presented with an immense golden disk on which were carved the symbols of the cyclical ages in which the Aztecs and their predecessors in Mexico believed. That precious artifact has been lost forever, having been quickly melted down by the Spaniards; but replicas thereof, in stone, have been found. The glyphs represented cycles of the "Suns" or ages of which the present is the fifth. * the second, the Golden Age. * and the fourth was the Age of the Black Haired People, with whom the supreme Mexican god, Quetzalcoatl, had arrived. "All the way south in the pre-Columbian Peru, the Andean people also spoke of five "Suns" or ages. * followed by the Age of Primitive Man. * and then came the fifth or contemporary age, the Age of Kings, of which the Inca kings were the last in line. Hey DarmonVing, thanks for the additional info, some of those links I had never read before. When I was on GLP, ATS and OSA forums I tried to tell everyone that the so-called aliens were among us and had blue eyes but since the majority of internet forum users had blue eyes, I was attacked and ridiculed. I believe Mormons and Jews are hominid hybrid creations. My theory derived from my experiences of 2002 which you can read in paranormal Section. My belief is we have at least two root hybrid races... one with light blue eyes, and sensitive skin and the other with dark eyes, dark hair and dark skin due to being on the surface of the earth for the longer period. When the blue eyes mixed in with the existing dark eyed race, the result was dark haired with blue eyes and I believe that's where green, brown and hazel eyes come from.... due to mixing. This mostly shorter, smaller, darker skinned race is the slave labor race and has been exploited for a long time and continues to this day. They are used to mine for gold, silver, copper, coal, gemstones etc. and to labor in the fields. Most likely the dark races were created specifically for labor since pale face who speaks with forked tongue could not tolerate the intense rays of the sun here on Earth. Note: As I was writing this, Venus flashed into my head. I think this pale race comes from Venus. I'm still trying to put all of the pieces together, but the evidence does suggest that the red and blond haired blue eyed race has been on earth for thousands of years and is quite advanced. I also believe they can use more of their brain, telepathy and such and are extremely intelligent, speaking several languages (like Cleopatra). I believe there was a great war on Earth about 12,000 years ago and caused these blue eyed races to regroup and breed more in order to conquer the world... again. I also believe there's another species, an aquatic type of which I have some of their genes. I call them the "marshmallow people". They interbred with my grandmothers family. Out of the 8 children, they were all different. You will also find this "marshmallow" population mixed in with those who claim to be jews, American blacks, Chinese, S Americans, Mexicans, New Zealanders and other areas. The 600 pound woman who was recently fused to her couch is a prime example of this other species which has interbred with earths human/hybrid population. Ariel Sharon is also one, so was Winston Churchill as well as Kim Jong il of North Korea. China now has over 200 million overweight people. They will eat every last living thing on this planet. If not for cloned cattle, pigs and chickens, we'd already be eating dirt. All of this advanced technology we see and use today is NOT new, it's just been recently introduced to us, gradually. Let me make this clear, I believe there is also a good white race, as evidenced by those who share knowledge, wisdom, technology and information to educate us and enlighten us while opening our minds. We are using their technology right now. Ok, I rambled enough, hope I was coherent. It took me so long to write this out that you posted more gems. It's starting to fall into place. I was talking to one of my friends yesterday about these red haired people and he hooked me up with some additional information on them that I had never heard before about a race called the Tuatha da Danann. I've heard about them before since I do have a slight interest in ancient cultures and knew that they had basically infested Ireland for a while many centuries but really didn't know how they had gotten there or what they looked like. He basically told me that they had literally landed in Ireland and that at least some of them had red hair. At first I thought that he was making it up, but I googled the Tuatha da Danann and found this account and some additional information about them. According to the Annals of the Four Masters, the Tuatha de Danann ruled Ireland from 1897 BC to 1700 BC. The story of their invasion of Ireland and subsequent war with the Fir Bolg (the previous inhabitants) is a fascinating chronicle of ancient Irish history. When the Tuatha de Danann first arrived in Ireland they landed in Connaught. Legend says that they landed on a mountain in ships of the sky that blotted out the sun for three days. Thus, from the mists they appeared. Some say that the story is simply a fabrication, while others conclude that the Tuatha upon landing, burned their ships, determined to stay in the land. Likely, the Tuatha de Dannan were just sick of the voyage and decided to settle down. But the Tuatha were not welcomed by the current residents of Ireland, the Fir Bolg. After a time of negotiation, the two sides joined battle. The Fir Bolg were defeated, but they had given such a good fight that the Tuatha let them keep Connaught and took the rest of Ireland. The Tuatha were a highly civilized people, and tradition holds that the Fir Bolg held their conquerors in high esteem. The people of the Goddess Danu possessed remarkable domestic skills; so much so, that those they conquered deemed the Tuatha magicians and Gods. The King of the Tuatha, Nuada, had lost an arm in the battle against the Fir Bolg. Tradition has it that because he was now blemished, he could no longer be King. In his place the champion of the Tuatha de Danann, Breas (part Formorian or Sea raider), now became King. Breas ruled for seven years, but in this time, he thoroughly disenchanted his people by bending to Formorian demands. The people were not well fed, the crops were poor, and the final straw came when Breas insulted a poet. He was quickly ousted from command, and in his place returned Nuada, who now had a new arm made of silver. Breas fled to the Hebrides, where he complained to his father, a Fomorian. A great host (army) was raised, so large that their ships filled the sea from Ireland to the Hebrides. Upon landing the Formorian host and Tuatha met in battle at northern Moytura, in Sligo. The Tuatha won the day and the power of the Formorians was broken forever in Ireland. Nuada died fighting the Formorians, and a hero of the battle, Lugh, became the new King of Ireland. After Lugh, Dagda was king, and after Dagda followed his three grandsons. During the rule of the three grandsons, the Milesians came and in another great battle conquered the Tuatha de Danann. The Legends say that from then on, the Tuatha were permitted to stay in Ireland, but underground only. From then on they became the fairy folk of legends. The Tuatha's skills in the arts and domestic life were even respected by their conquerors the Milesians. It is said that the Tuatha had four great treasures or talismans that showed their skills in arts, crafts and magic. The first treasure was the Stone of Fal, which would scream whenever a true king of Ireland would place his foot on it. The next talisman was the Magic Sword of Nuada, a weapon that only inflicted mortal blows when drawn. The third treasure was the Sling-shot of the Sun God Lugh, that never missed its target. The final treasure is the Cauldron of Dagda from which an inexhaustible supply of food came forth. While much of the story of the Tuatha de Danann has been distorted over time, there is growing evidence that the story is based on fact. Remains from some of the battlefields have been found which cast a different light on the story as a whole. No longer are the Tuatha considered just Irish legend and fairies. Although three of the treasures are obvious stories proclaiming the glories of their Kings, the fourth item sounds very much like the legendary Stone of Scone that sits in Edinburgh today. They landed on the First of May and beaten the Fir BoIg in a battle and conquered Connacht and relatively the rest of the island. The curious thing about the landing is that they were enveloped by a fog which hid them from the eyes of enemy and they penetrated the country unseen. After beating the enemy they built their capital at Tara. The Tuatha De Danann were a race with magical powers. They were handsome and learned and except art and science, they were the supreme masters of wizardry. In the mythological cycle their place is among the Irnmortals. They were later classified as demons or fallen angels by the scholars. Bravest of all peoples, their leaders were wizards first and warriors second, whose victories were gained by superior knowledge and magic rather than by warfare. They were a fair complexioned race, with fair hair; either golden-blond or reddish, many having freckled skin. The women wore long robes, or long loose-fitting garments of ankle length. The clothing of the men consisted of a knee-length tunic, and a shawl or cloak, fastened at the shoulder with a brooch. The cloak that barely covered the shoulders was made of a thick felt or of coarse-woven cloth dyed with various brilliant colours. The men alone wore hats, or head-coverings, which were a soft felt. In times of battle they dispensed with any head-covering, brushing their long abundant hair forward into a thick mass, and dyeing it a striking red with a soap made of animal fat and beech ashes: their faces would also be painted with this dye in a variety of patterns, which would cause them to look more like wild creatures of the woods than men. There was also a mention of DNA evidence extracted from a hair sample taken from an alien during an abduction experience in another article that I read. The original DNA work was done on the shaft of the hair recovered from an ET by the abductee. Anomalies were found in the root of the hair. Two types of DNA were found depending on where the mitochondrial DNA testing occurs, namely confirming a RARE CHINESE TYPE DNA in the hair shaft and indicating a rare possible BASQUE/GAELIC type DNA in the root section. The hair sample seems to show it contains 2 deleted genes for CCR5 protein and no intact gene for normal undeleted CCR5 - this CCR5 deletion factor has been implicated in aids resistance. This is getting more and more interesting. Here's some more information. These people of the goddess Dana first used gold and sliver in an Age of Bronze. They first cleared the land, first drained the swamps. They built the great temples of stone like the one they sent to Britain—Stonehenge. [Always keep in mind that Stonehenge was first a Moon Calendar before it was converted into a Sun Calendar.] When conquered, they retired to their underground barrows or Sidhe where they still live today. Here they are described as the SHINING ONES. Could the shining ones also be the Illuminati? - I think so. The British Isles has the legend of supernatural beings, the Shining Ones, coming from the stars (Pleiades, the Great Bear, and Sirius) and bringing gifts of higher consciousness, spirituality, and secrets of civilization and agriculture (grain). These beings were also known as the Tuatha De Danann, "people of the Goddess Dana or Ana" and the Israelites (the original lost ten tribes). The Druids were the "Magi"-wisemen. Also known as Sidhe or Fairies, these Shining Ones were described as tall, fair of form (thus, the term "fairies" evolved), beautiful, young-looking despite their great age, gifted in the arts, the mind, music, and healing. Their magical harps sang by themselves. They erected the stone circles, standing stones and crystal megaliths which aligned the earth’s meridians and grid (ley lines) to the movement of the heavens, creating an intergalactic computer for connecting to the Divine. These were the peaceful prehistoric ancestors of the more aggressive Celts who arrived in 500 BC.